The New Sunset Western Garden Book is recognized as the proven, reliable, expert reference for growing plants and gardens in the West. 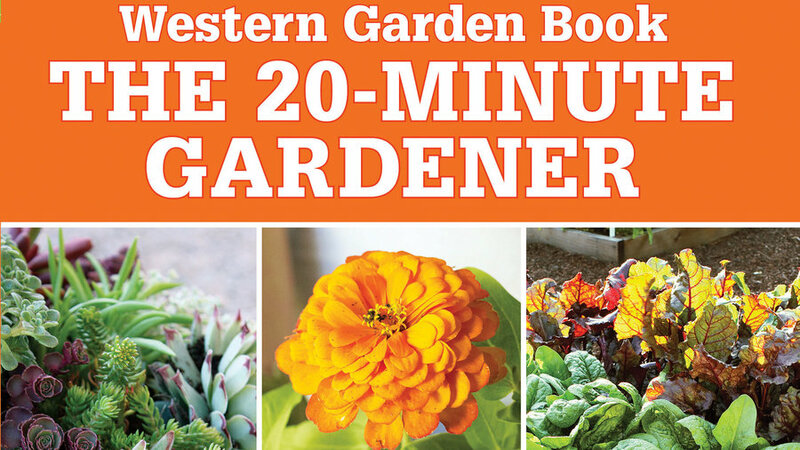 By extension, Western Garden Book: The 20-Minute Gardener, shows readers how to have a beautiful yet easy-to-maintain garden with minimal effort or time. This book is as easy to use as it is inspiring, whether you grow plants on a balcony, in patio containers, or in a small backyard. Discover how the quickest fixes can turn a quiet garden into a magical outdoor room. Freshen problem spots with our inspiring projects. Plus designs for pots, paths, and easy-care beds – many with step-by-step instructions. Grow some of the West’s best 160 plants, profiled and pictured in an encyclopedia, with easy-to-follow planting guidelines. Tend your garden following our simplest techniques for amending soil, making compost, planting, and watering. Find your region in the 16-page Regional Gardening Calendars, then follow our tips for what to do in your garden each month. Available wherever books are sold, or buy Western Garden Book: 20-Minute Gardener online now.